AHMEDABAD, INDIA--(Marketwired - Oct 8, 2013) - The Courtyard Ahmedabad, a hotel near Sardar Vallabhbhai Patel Airport in Ahmedabad, recently won the My Marriott Mate Competition in Asia Pacific, proving that the hotel is a great place to work. For this competition, Marriott asked associates working at Marriott hotels in the Asia Pacific region to submit a brief video showcasing their "Marriott Mate" -- the colleague they most appreciate. 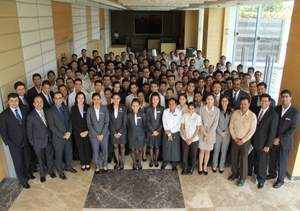 Staff members from 78 Marriott hotels submitted 100 videos for this competition. After judging dozens of videos, President and Managing Director of Marriott International Asia Pacific Simon Cooper selected four winners, including two staff members from the Courtyard Ahmedabad: Adithya and Akshay. "Having a best friend at work is really important as we spend most of our time working than at home," Cooper said. "Friends at work go a long way in creating a positive work environment." The exciting 90-second video submitted by Adithya and Akshay follows the two friends throughout their day, from morning wake-up through the end of a busy work day. Throughout the day, the friends share tea, take a break to play table tennis, and work together in a fun and collaborative work environment. "The entry wonderfully brings out the story of two best friends and how in the daily routine of Courtyard Ahmedabad, their work and personal lives are intertwined," Cooper said. The Ahmedabad Satellite hotel was also voted one of India's Best Companies to Work for in 2013 by Great Places to Work. Marriott International has also been recognized as one of the World's Best Multinational Workplaces for years. Located in the bustling capital of Gujarat, the Courtyard Ahmedabad is a luxurious and welcoming hotel that is just minutes from Ahmedabad's tourist attractions, including the Hare Krishna temple, the Calico Museum, Kankaria Lake, Nehru Park, and Shaking Minarets. This hotel offers wireless Internet access throughout the rooms and public areas, concierge service, laundry service, a business center, and complimentary on-site parking. The 164 guest rooms are outfitted with luxurious marble bathrooms, spacious work desks with ergonomic chairs, coffee/tea service, iHome docking stations, and high-speed Internet access. Share a great dinner with friends at Shakari, a fine dining vegetarian restaurant that features Hyderabadi, Awadhi, and local specialties. For a more casual meal, grab a quick lunch from Momo 2 Go, the on-site deli, or have a cup of coffee at the hotel's 24-hour coffee shop, Momo. Fitness-focused guests can stay on track at the hotel's fully-equipped gym or swim laps in the outdoor pool. After, unwind in the whirlpool or indulge in a massage or facial at the 02 Spa. With 6 meeting rooms and a total of 6,200 sq. ft. of meeting space, including a spacious banquet hall in Ahmedabad, the hotel is also the venue of choice for meetings and events in Ahmedabad. The Courtyard Ahmedabad recently won the My Marriott Mate Competition in Asia Pacific, proving that the hotel is a great place to work. For this competition, Marriott asked associates working at Marriott hotels in the Asia Pacific region to submit a brief video showcasing their "Marriott Mate" -- the colleague they most appreciate.